William was born in Winchester in 1891. His parents were William Christopher (b.1868 Dorset – d.15/11/1957 Southampton aged 89) and Harriet Ann, nee Williams (b.1867 Dorset – d.17/04/1953 Southampton aged 86). They were married in Southampton in 1889. The 1891 census shows that William’s parents are living at 6 Cross Street, Winchester, so William may have been born here. His father is employed as a Baker. In the 1901 census William is living with his parents and his brother Arthur Henry (b. 30/06/1893 Winchester – d. 19/05/1980 Southampton) at 107 Priory Road, Southampton. By the 1911 census they are all together living at 154 Shirley Road, Southampton. William and his father are working as Bakers and Arthur is employed as a Tailor. The Army Service Corps received the Royal prefix in late 1918. William’s service records cannot be traced as men who served in the RASC are amongst the hardest to research as there is little information given in their service and medal documents. 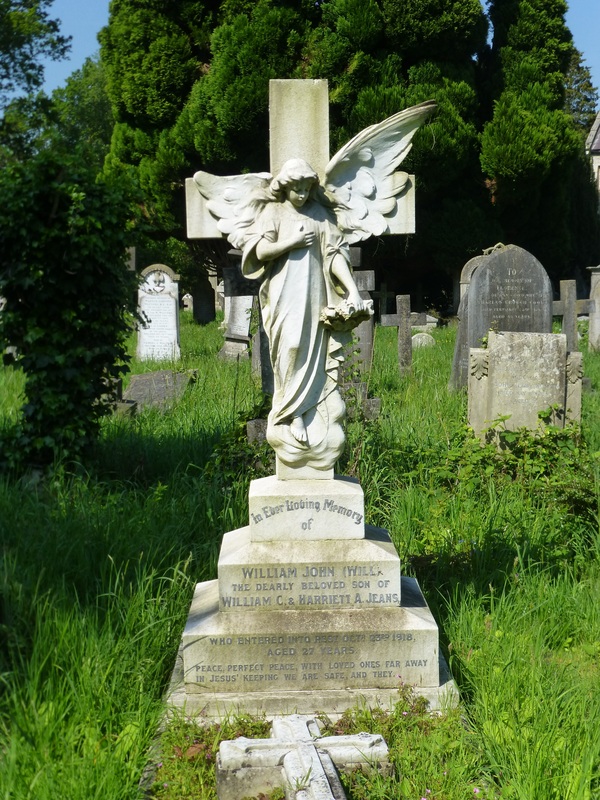 William died in Andover on 23rd October 1918 from pneumonia. He was awarded the Victory and British War medals. He is buried at Southampton Old Cemetery Grave Ref. 40.F.79 – photograh and inscription given below. At the time of his death William’s parents were living at 13 Osborne Road Southampton. On Jesus’ keeping we are safe, and they. ‘The unsung heroes of the British army in the Great War – the ASC, Ally Sloper’s Cavalry. Soldiers can not fight without food, equipment and ammunition. In the Great War, the vast majority of this tonnage, supplying a vast army on many fronts, was supplied from Britain. Using horsed and motor vehicles, railways and waterways, the ASC performed prodigious feats of logistics and were one of the great strengths of organisation by which the war was won. ‘With their usual wry deprecating humour the soldiers of the British Army labelled the Army Service Corps – later the Royal Army Service Corps – Ally Sloper’s Cavalry. Ally Sloper was a British weekly comic strip about a rent-dodging con man and drunkard that first appeared in the late 1880’s and ran with huge popular success until the early 1920’s. The cavalry jibe probably referred to the huge numbers of the comparatively unglamorous draught horses and mules that the ASC deployed on the Western Front. In 1914, at the outbreak of the Great War, the ASC was under two Directorates: Transport and Movements; Supplies and Quartering. In September 1914 these two directorates were reorganised and a Director of Supplies and Transport (Brigadier S. S. Long) was appointed. The ASC was already a complex amalgam of units with different responsibilities, and as the war progressed these units became much larger in size and of increasing diversity in function. The basic organisation in 1914 was of ASC Companies that individually specialised in duties including horse drawn transport, mechanised transport (including buses and ambulances), stores/warehousing, quarters for men and horses, remounts (replacement horses), railways, catering etc. As the war progressed additional responsibilities were undertaken including the management of civilian Labour Corps formed from various nationalities. The ASC was one of the Cinderella units of the Western Front and it received little in the way of commendation, or entries, in the official reports of the Great War. Although the 200,000+ officers and men of the ASC who served on the Western Front could not normally be considered to be combat soldiers, many were exposed daily to the capricious dangers of the battlefield as they moved around it performing their varied duties of supplying and transporting the fighting man. Certainly the German Artillery deliberately concentrated on the ASC supply routes, depots and resting places of the ASC’s animals of burden. On occasion, when the military situation demanded, (e.g. The German Spring Offensive, March 1918) the ASC troops were ordered to take up their rifles and were drafted into the Front-line defences. Also, whole groups of ASC men were drafted into Front-line battalions and other active service units as replacements for casualties whilst their place was taken by troops who were not considered fit for Front-line duty i.e. ‘B’ and ‘C’ medical grades. Additionally, colonial and Empire troops were drafted into ASC Transport and Supply Companies to release additional ‘A’ medical graded ASC men. Something like a total 100,000 fit ASC troops were so released and retrained for posting to fighting units on the Western Front, including over 100 officers to the Royal Flying Corps. With fighting men and women On land and sea and skies. For we’re the old RASC, They call us Ally Sloper’s Cavalry. And C is for the comforts you never get In the bleeding RASC. There’ll be Hitler,Goering, Ribbentrop All there to watch the show.